Classic Army is a leading manufacturer of Airsoft products, setting standards for the entire industry. 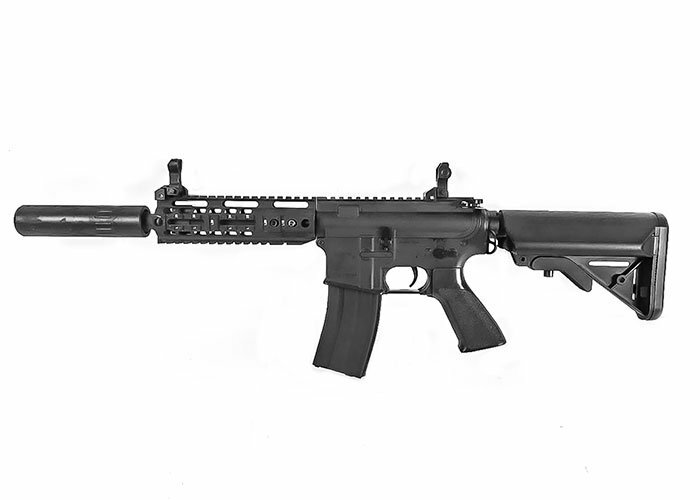 This model of the Classic Army N4 CQBR AEG will ship directly from the manufacturing center. Additionally, the N4 is priced lower since the product is coming from Hong Kong! This is literally one of the best deals on Earth considering the package can ship to any country where its legal. It's time to get your hands on this affordable deal coming straight out of the factory! The N4 CQBR exceeds optimal performance with its reinforced gearbox and upgraded internal parts. Classic Army has also included a spare gear set and piston in the event you need to replace your parts in the future. The quicker change spring system allows you to easily upgrade or downgrade your spring once you remove the gearbox from the receiver. Front and rear flip up sights are included with plenty of rail space on top for you to mount an optic or anything you wish. Utilize the quad rail on the 8" N4 rail system to attach your grip, flashlight, or any other accessories you desire to help squash the competition. Take this opportunity to get a great performing gun for a discounted price directly from the factory! Airsoft GI is not responsible for items that cannot be imported into your local country. These come direct from the factory, so we cannot give exact weight, but should be around standard metal m4 weight. Can it be imported into the u.s? all models delivered to the US via factory direct will have an orange flashhider compliant with US law. Is this made of metal or polymer construction?